> Pressbooks>NEPTUNE FACTOR pressbook '73 great sci-fi art of giant fish & sea monster by John Berkey! 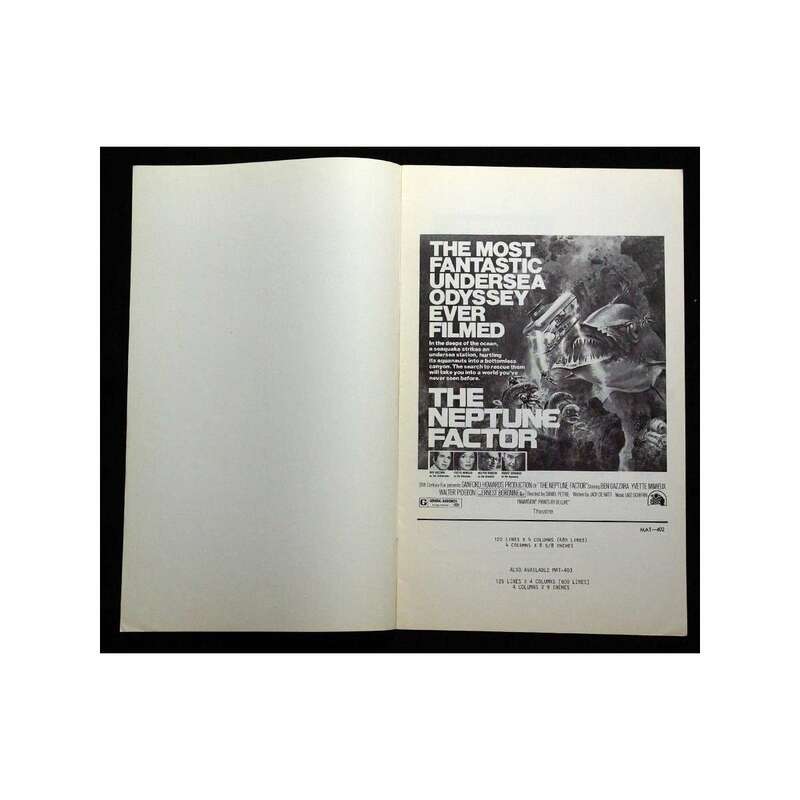 NEPTUNE FACTOR pressbook '73 great sci-fi art of giant fish & sea monster by John Berkey! An Original Vintage Theater-Used Movie Pressbook (pb; measures 8 1/2" x 14" [22 x 36 cm]; 12 pages) Condition: Very Good (C6) See our 10 GRADE SYSTEM Page for more information. The Neptune Factor is a 1973 science fiction film directed by Daniel Petrie, featuring underwater cinematography by Paul Herbermann. The film's special effects utilized underwater photography of miniatures with actual marine life. 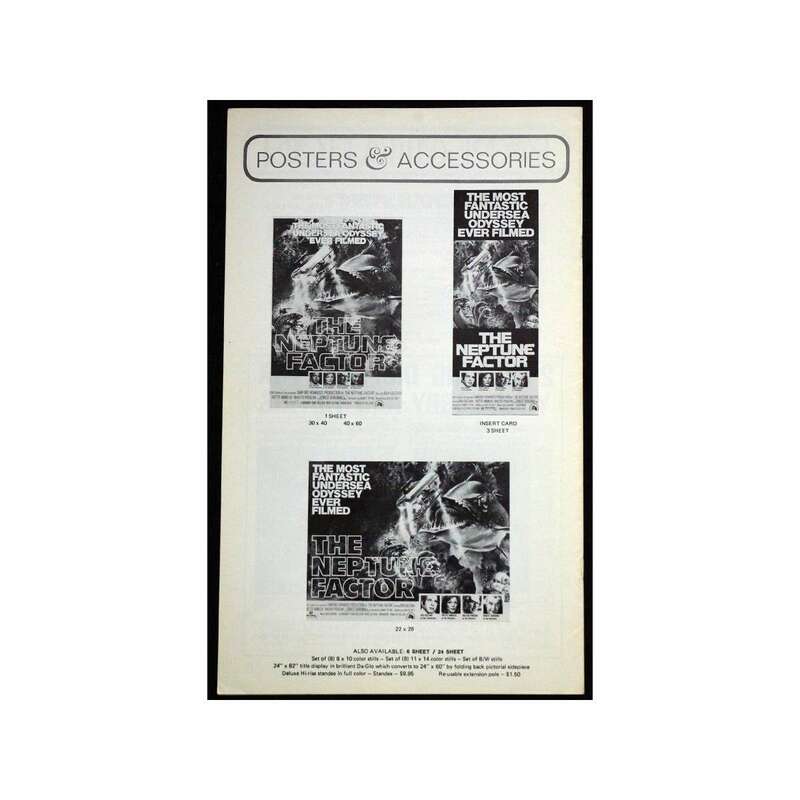 Important Added Info: Note that we have provided an image of the front and back covers of the pressbook, plus an image of a two-page spread from inside of the pressbook, and of course, the purchaser will receive the entire pressbook! Also note that this pressbook is complete and uncut! Given that theater owners purchased pressbooks partly in order to create their newspaper advertising, and quite frequently cut them up for that purpose, it is rare to find a pressbook that IS complete and uncut! Overall Condition: very good, NO CUTS.